My Zara jeans were bought in Cape Town in October 2017, on a whim. I found them as I was walking out the store empty handed. 10 minutes later, I had paid and made off with my latest jeans, which are still a favourite pair almost one year later. They’re produced in Turkey and are 98% cotton and 2% elastane — according to the label anyway. So, let’s unpack the fabric side first. The most common denim is indigo denim. The indigo dyeing process, in which the core of the warp threads remains white, creates denim’s signature fading characteristics. My jeans are starting to fade based on wear, and I love it, they feel like they have my stamp on them. Denim is made from cotton which is harvested by hand or machine. NB. my jeans are not organic cotton, just regular cotton which means pesticides have been used. Elastane is a synthetic fabric known for its elasticity. Great for ensuring your jeans retain their shape. The more stretch you have in your jeans, the more elastane. If you have a moment, watch RIVERBLUE which follows international river conservationist, Mark Angelo, as he travels around the world infiltrating one of the world’s most pollutive industries, fashion. This documentary examines the destruction of our rivers globally, its effect on humanity, and the solutions that inspire hope for a sustainable future. I urge you to watch this because the denim/jeans industry is the biggest polluting industry with dyes and chemicals to achieve certain stonewash and whiskered etc effects on the jeans. So back to cotton and back to Turkey…. Research reveals that the cotton industry in Turkey has one of the highest rankings for child labor. So brands are taking a stand but is it enough? So we’re obviously dealing with a credible company here, friends. Back to Wikipedia…what does it say about Zara and child labor? When I started to research child labor in Turkey, it pulled up several articles about unpaid garment workers slipping tags into Zara clothes saying they were never paid for the production of these items. The factory they worked at producing clothes for Zara (and Mango and Next) closed without paying them in 2016 and in 2017, out of desperation, they took action. 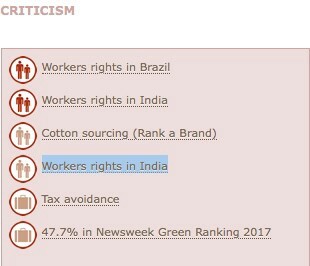 Initially when I read up on this, I thought the factory owner should take full responsibility, however…if Inditex (Zara) has such a firm stance on people receiving a living wage, having an ethical supply chain, and they did go on to actually sell these garments and profit, they are responsible to a certain extent. These garment workers are begging to be paid for work they did. And they did it in a way to make their voices heard with the public (and media) as liaising directly with the brands did not yield a result. However, further research led me to Good on You website. 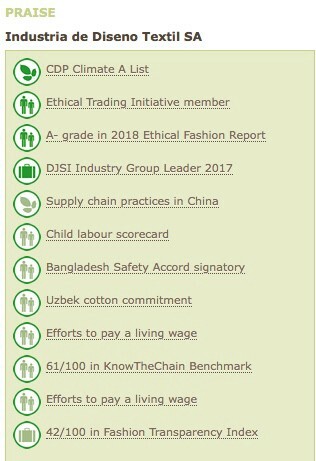 The 2018 Ethical Fashion Report– which looks at criteria including payment of a living wage, transparency and worker empowerment initiatives — Zara scored an A+in policies, auditing and supplier relations, an A for knowing its suppliers, and a B for worker empowerment. Suppliers and manufacturer partners with Inditex are required to follow their Code of Conduct, and their traceability systems allow them to know exactly how their products are made, and where they come from. Inditex also states it has a total ban on child labour, forbidding any employees under the age of 16 to work in their factories, as well as a ban on forced labour and discrimination in the workplace. So is the issue with the unpaid Turkey factory workers an isolated incident in terms of suppliers and manufacturing partners? Did they not look into this supplier properly? Was he credible when he started working with Zara and the wheels came off? I do believe the cotton for my jeans was harvested by a child. I do however believe that my jeans were made up by a garment worker who is not a child and earning a living wage. I can only hope that I’m wrong on the first point and correct on the latter.